How Bunnies and Eggs came about on Good Friday? This Friday marks the Easter Weekend. The true meaning of Easter isn't much about bunnies and eggs, but an important holiday Christians celebrate. In short, Good Friday is referred to the day Jesus was crucified on the cross and on resurrection Sunday, the third day after His death, He rose up from the dead. Christians are firm believers that Jesus is risen and alive today. This year, Jazz finally popped the question of asking, how are eggs and bunnies related to Easter? I'm glad I was asked. Like Santa in Christmas, bunny is a symbolic character to Good Friday. There's no story in the Bible that mentions Santa or Bunnies. It was however version-ed that long before Jesus was born, some people in Europe worshiped the Goddess of Spring, whose had the name 'Eostre'. They thought the goddess brought spring and with it the sun would get stronger. Some believe that Easter got its name from her and associated her earthly symbol with that of bunnies. Bunnies being prolific creators are symbol of fertility since they give birth to large litters in the early spring. This was also extended to the new life of the followers of Christ. We certainly know we should Not be telling our children that bunnies, hares or rabbits lay eggs. Or worse, only Easter bunnies lay colourful eggs. Let's be sure that bunnies being mammals, give live birth and that number of young brought from birth is called, litter. How about a little more for education? The male is called a buck, the female is a doe and a young rabbit is a kitten or kit. I do like the association of fertility and rabbits though. 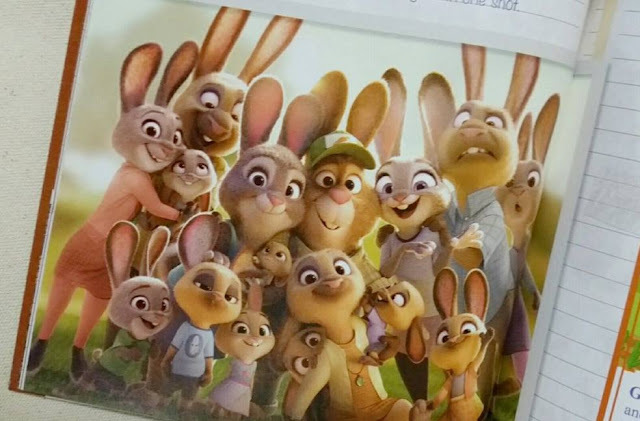 Jazz will tell you that Judy Hopps from Zootopia has 275 siblings! The words Easter and Christmas are not mentioned in the Bible. It was only in later church history that these were mentioned. 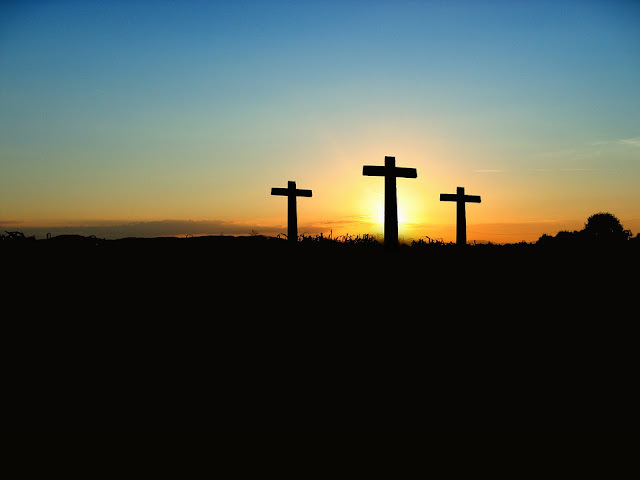 Since it is myth that Easter could have gotten its name from the goddess, Eostre, many Christians do prefer calling this Holy week, Good Friday and resurrection Sunday. The eggs are symbol of new life. Think red eggs on a baby's full month celebration in the Chinese tradition. From a Christian perspective, Easter eggs are said to represent Jesus’ emergence from the tomb and resurrection. As when they are cracked open they stand for the empty tomb. Again, there's no story of eggs mentioned in the Bible. This is however one nice symbolic representation of new life, resurrection and empty tomb. I’m most glad to dispel any doubts the kids have about the Holy week. Jazz was also highly curious about the passover, as well as how the date of Easter changes every year. We're thankful for the Bible classes in school. You do know your child is maturing when the questions get more intelligent throughout the years. That's how Google became my best friend. It's good to have intelligent questions answered to the best of our resources. In an evolving world, many facets of different festive, whether religion, tradition or cultural linked have surfaced. I will say the biggest winners are the businesses who tap on occasions to convince you of your spending. Well, let's boom the economy together. Creative ideas are to be appreciated after all. If you were to ask if we participate in the Easter or Christmas activities with no factual stories within, I will say, “Yes!” The kids love egg hunting, painting, gifts giving and receiving, and of course, the jolly candies too! As long as we don’t advocate any essence of evil or bad play, we do know what fun we are in for. So then, have a great time soaking in God’s love this weekend and have much fun with the many Easter activities going around the Island. 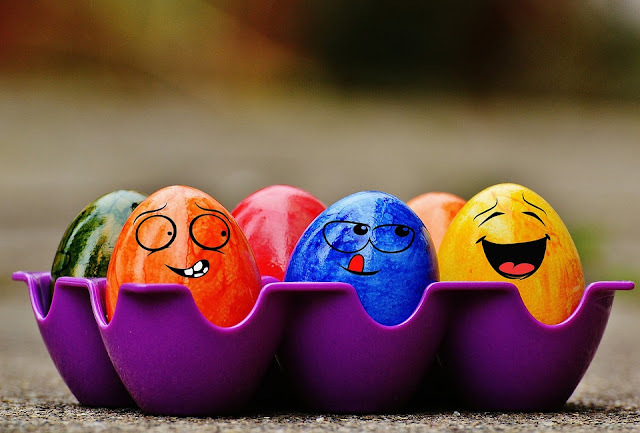 Or if not, how about a home activity of egg hunting with much fun within?!! Maybe an online Biblical story of Easter for kids is a great read too. Have a blessed weekend ahead! Holiday fun with shoes and pottery making! It's a closure to the March school holidays. I'm glad that Js had been meaningfully occupied throughout that week. We set foot in Spurbox to make their very own pair of shoes and pottery! It was most exciting, as it was their first time getting their hands on these activities. It was mine too. I mean, who would be making shoes from bare minimum at this era?!! I was honestly more curious than the kids. The kids were introduced to the different parts of a shoes and the various designs that had evolved through the decades. Two different sewing techniques (Blanket and Baseball stitch) were demonstrated to put the cut out leather together. It was most wise that the leather had been pre- punched with holes for sewing. I was initially worried that sewing might be a little too challenging for Js, as we know dealing with needle and thread at this age is one tricky affair. I was relieved to find everything super child friendly. The needles were toy liked for kids, not pricky at all and gets the job perfectly done. The blanket stitch was one skill to master. There were 2 needles of different colours and each needle had their role to play in getting the stitch right. I've to say Js had some initial frustration in getting them right. Only after a few practices, they got the hang of it and did it more independently. One thing I love about Spurbox classes is that they've always got enough teaching assistants to help around. Even though it was parent accompanied, I got switched off when it comes to sewing. Most glad they came in to assist Js. In midst, the kids were treated to a time of story telling session. Most love how thoughtful and creative they came up with props and related story on shoes. You guessed it, The elves and the shoemaker came live with the kids. You could tell how each child enjoyed the session with those attentive ears and focused eyes. Break time and light snacks were given. The kids got freshened up and went back to sewing the other side of their pair. After which the baseball stitch was taught to sew the backstay (strip of leather at the back of the shoe). In no moment, I was one proud Mama witnessing the final product of their stitched shoes! We laced it up on the side to make it a tighter fit. And topped it off with decorations. Ta da! Those shoes were ready to be worn. Ain't kidding you, they are wearable and Jazz wore them home that day, in replace with her factory made. How cool is it to be wearing self made shoes?!! It really was one great achievement that got them highly satisfied. I wished I had a self made pair too. Js and their self made shoes! So yeap, shoe making is one interesting activity to get those hands on. And we realized too, handmade shoes are so pricey because of the much effort involved. Can't help but to think these shoes look so like those of the stone age days. We attended too, Pottery class in the very same week. Js chose their desired classes, with the only condition that they have to attend the same activity. For the convenience of their Mama you know. The kids were introduced to the different types of pottery - earthenware, porcelain and stoneware. And of course, they had their hands on crafting their pots with the 2 methods taught. First was the pinching method without pottery wheel, and the other was with the pottery wheel. Pottery making is one messy affair. It was wise for storytelling to precede the mess. The story of the cracked pot was introduced. Have you heard of it? A story about how an imperfect cracked pot leaked throughout its journey from being full to almost empty upon its destination. It felt bad that it couldn't carry that full portion of water always. But what it didn't realise was the use of its defect. Its leak had watered the ground of flower seeds along its path and because of this flaw, flowers blossomed. I hope the kids did realise that imperfection is one beauty too. Pottery making is one that requires much patience and fine finger skills. It was some good training within. We weren't training to be master potters, I had left the kids with much liberty to craft their desired pots without much of intervention. It was tough that I kept my hands totally off as the fun factor was highly attractive. Those were their final works and I ain't really sure what are they gonna put in there. What mattered most was that they had enjoyed their sessions tremendously! I can't wait to find out what's coming up for Spurbox's next holiday programme. Do check in too, for any upcoming creative art or culinary classes at Spurbox. I heard Mother's day baking class is up for booking! You will love how their classes are mostly parent accompanied at no additional costs. Definitely a great way to bond! Disclaimer: We were invited to review 2 sessions of holiday classes. All photos and opinions are as usual our own. Do you do your outdoor frequent at Botanic Gardens? We found a new addition next to the Gardens Shop @ Tanglin Gate! While we were invited to a paper quilling session among the lush greenery, it was nice to be introduced to a Book Bank just next to the shop. The campaign was started by Gardens shop to cultivate a love for reading, especially among little ones who visit the gardens, as well as to make bonding time with the family more fun and rewarding. Bookshelves are stocked with books and visitors are encouraged to pick up a book or drop a book in exchange for a title that interests them. So if you've got a pre-loved book to bless another avid reader, bring it down the gardens for bless or exchange. Readers may take a book or 2 to a quiet corner or to their picnic by the gardens. It's a wonderful combination like a Roman philosopher Marcus Tullius Cicero once said, "If you have a garden and a library, you have everything you need." Just how tranquil that sounds. And of course, don't forget to explore the park with much fun and reading! The greens will do much good to your eyes after some fixation on the pages. Great fun in the gardens! Do remember now to bring a book down for exchange or drop off the next time you visit our UNESCO World Heritage site, Singapore Botanic Gardens. It just got more exciting! Have a great time reading outdoor! And if it gets to warm, get cooled in the gardens shop for some shopping time. 5 reasons why you need to catch Disney on Ice! It's been a long time since I last stepped into the Singapore Indoor Stadium. Am most glad to be back there for the most spectacular show in town this season, Disney on Ice, Magical Ice Festival. Produced by Feld Entertainment, Disney on Ice has taken millions of people across the globe on a magical flight of fancy for more than 35 years. Be convinced of its experience and professionalism. We were most happy to have twirled through the world of enchantment, witnessing characters and stories coming to life on ice. Our friendly hosts, Mickey, Minnie, Goofy and Donald introduced and brought us through a magical journey with Ariel and friends from Under the Sea, Rapunzel from Tangled, Belle from Beauty and the beast, and finally, the most anticipated, casts from Frozen! In this showing sequence if memory didn't fail me. Yes, we can't. We are still holding on to that great love for Frozen. I loved every single casts of the show and was most impressed that they showcased not only a big part of the story, but almost all of the well-loved Frozen songs were sang and danced to. This was also Jare's favourite part, because of his love for Olaf and Sven! A must watch for any fans out there. It wasn't exactly a princessy affair. Jare enjoyed every part of the show. The many scenes were made enchanted with dazzling lighting, mini fireworks and snow effect. For Frozen, it really did look like Arendelle was in deep deep deep deep snow. Impressive too, were those glowing lights on Anna and Elsa's cape. Oh! So Pretty. I do love Rapunzel's hair too! The performers of every story scene were incredibly talented! Lavish costumes, props, songs and expressions were well displayed that it brought so much fun and joy to the audience. The scenes set up were impressively authentic to the stories and children were thrilled that they sang and danced along with familiar songs. So popcorn and cotton candy might help keep excited kids on seat. But of course, dance like there's no tomorrow! Jazz said her favourite part was Tangled. She confessed her envy for Rapunzel's long luxurious hair. And actually, I love that style of hair too! It's more than just musical stories, but the art, choreography and appreciation of ice skating. Graceful art indeed! It's one pity that we don't have a Disney theme park in Singapore. Opportunities like these are as close as we can catch without taking flight. So, don't let it go! 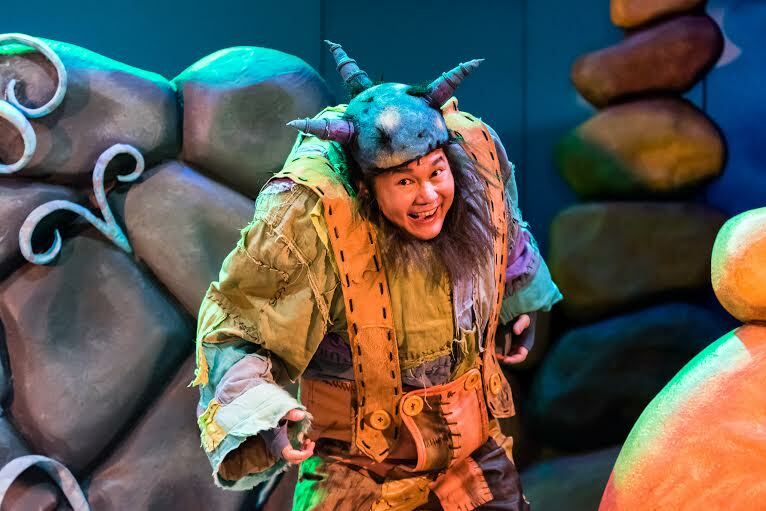 This show is definitely one great treat for the little and big fans out there to let their hair down and relax after a term of hard work in school! There's just so much fun and memories out of it. Parents, this will be one rejuvenating break for you too. Looking at CAT 1 ($65) and CAT 2 ($45), view seems comfortable. But if budget is a concern, leave the Daddy out for his coffee break while Mother and child can go for their royal party. And of course, if budget allows some stretch, go for the better seats in front! Shows and tickets are still on sale till 20 March. Online purchase here. There's a child-likeness in me. I enjoyed it as much as the kids did. There wasn't a single moment of disappointment or any room for boredom. Spectacular indeed! Set expectations for the kids. Let them know who is and who is not appearing. In case you have a faithful snow white fan who might be whining all the way home. If weather is wet, it may be more convenient to park your car at Kallang Wave Mall. Walk is all sheltered to the stadium. For fast access, try to carry small or no bags. Security clearance is needed. It can be rather crowded before and after show. Keep an eye on your kids. Arrive early if you need to get souvenirs or snacks for the show. Booster seats are available. Be early before they run out. Show starts very punctual. Be on time. Taking pictures and videos are great keepsake, but don't get too busy that you forget to enjoy the show. The show is about 2 hours plus a 15 minutes intermission. Bring related props, accessories, wear costumes, be part of the show and enjoy! We are really thankful and happy to be part of this royal party. It was a nice welcome to the school holiday. Disclaimer: We were given tickets for the purpose of this review. All opinions and photos are solely ours. I said 'sorry' to my daughter. It wasn't tough putting that parenting pride down. I think about the times I sat my child down for a heartfelt apology from me, it was rare. Either I was managing emotions well, too prideful or rather, apologizing should not be a frequent habit that we don't learn from mistakes. So much about teaching the kids on 'saying sorry', I'm glad I had an opportunity to learn and reflect again. Saying 'Sorry' to my child was nothing about embarrassment, but all about nurturing and moving on for a better relationship. Not a single moment did I feel it was wrong to say, 'Sorry' or was I submitting myself to an authority. We know respect is mutual regardless the age. I will say, the more sensible being of the parties should make and teach the good initiative. That's me, the Mama. Last week, I blew up and got mad with Jazz, threw her paint materials and lovely artworks into the trash. All because she decided to leave them like orphans in her room. It was of multiple attempts asking her to clean up and tidy things back to where they belonged. Those umpteen nags got my anger at stake. All these chaos just before her bedtime. And we were so overrunning bedtime that I didn't find time to cool, calm and mediate the situation before she ends her day in sleep. She went to bed in hurt and tears. Hurting her bugged me so much that night. How could I have thrown her hard work into the trash?!! They were some time and effort spent. I knew there was a better way to handle that situation of mess. We found time to talk the next day. I looked into her eyes and told her, "Sorry for throwing your art pieces." We went on to talk about what should have been done, what I shouldn't have done and how we can prevent. A talk like this was healing for us both. In fact, I knew she would be one happy child the next day because of how quick little kids forgive and forget. But then, I do think she is no more one toddler. We do need to handle situations with new maturity at different stages. We did recovery together by rummaging through the bin for the pieces. And now, there's just so much story in these artworks. It was more of a lesson for me than her. I felt the need to apologize for that emotional hurt, which could be a deep one. I didn't want a memory of such to be ingrained in her, and I knew apologizing was a comforting closure for us. I did learn, parenting is not about ourselves, but the many opportunities and decisions we can choose, to focus more on our kids. Thank you Darling, for this opportunity to model humility. We all make mistakes, and I know what I am sorry about. I don't do everything right in raising my kids, but I learn. How often do we remember to put down that parenting pride? 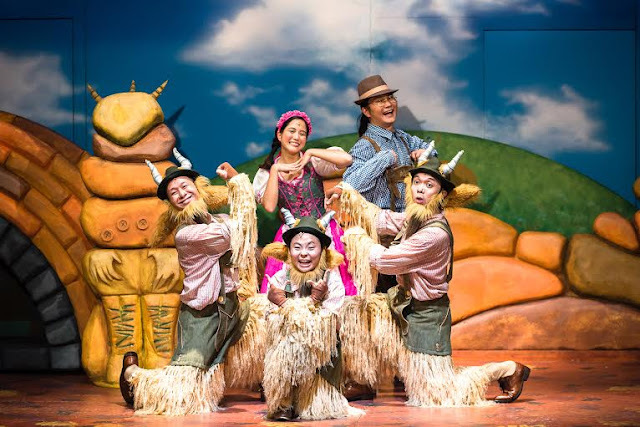 It's been almost a year since we last caught the play, The Three Billy Goats Gruff. Following its successful production, we were most glad to be back catching this play again. This time in Mandarin, 三只山羊. Even though a play of the same setting and storyline, Js were keen to be in for a treat again. And of course, their Mama love it that we can catch a meaningful stage play in Mandarin. Not an easy find locally. It was an entertainment that offered another great opportunity to learn and love the language out of the usual classroom settings. The conversational, educational, hilarious and interactive mix of Mandarin were creatively stage in this play. Then one day, it dawned on them that they were in the middle of a horrible drought. The grounds turned a dreadful shade of brown, they were slowly but surely running out food. As the gang decided to cross the bridge to the other side of the valley, where grass seemed greener, they had to take on a frightening troll, 怪兽 that loves to feast on goats! The troll did look terrifying, but I thought he was probably the most humourous character in the play. He assured the audience that he only loved feasting on goats, not wolves, not humans and specially not kids, because they ate too much candies and were too sweet for his appetite. He joked that he would get diabetes for feasting on children! That sent us all to stitches. There were many terms that the kids and grown ups can learn through this play. One which I particularly remember was, 知足常乐. Which means a contented mind is a perpetual feast! I often remind the kids about self contentment in English, but we had never spoken or related it to the Chinese term. It was one refreshing term for us. Another particular scene that specially impressed us was, baby goat chewing on paper, claiming that she was overly hungry! And yes, she was literally eating paper with nothing spat out. I thought it was some clever stage act to trick the audience. Only to find out the truth during photo taking when the kids were handed some 'paper' to eat, they were edible! Just how creative they are from staging acts to solving mystery in the little minds. CAT 1 tickets come with a photo taking session with the casts (weekend shows only). In sum, the show was very well played with witty and humourous lines that were different from its English. 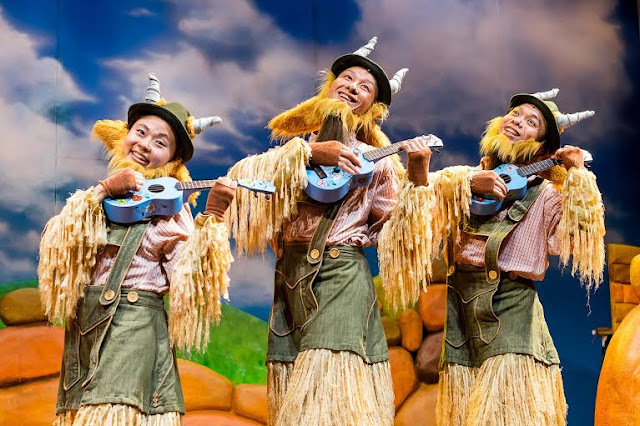 The translated tunes remained catchy and its Mandarin was very well articulated by their very experienced casts. Behind every solid work is always some talented, experienced and credible people. The Chinese adapters are Danny Yeo and Zhang Lesheng. Zhang is a Singapore lyricist who has written more than 300 theme and sub theme songs in our local drama scene. He has a great love in cultivating interest for the Chinese Language in the younger generation through his lyrics. So be assured, it is another quality production of SRT. This great musical for every young and old should not to be missed! It really is one fun way to enjoy and love Mandarin the unconventional way. I am highly pleased that Js enjoyed the play so extremely much that we are still joking about how the troll will not want to eat them, because they are too sweet! Venue: KC Arts Centre – Home of SRT , 20 Merbau Rd Singapore 239035. Family packages available too. Tickets at sistic. 3. Tag 3 friends on this Facebook post whom you think will be keen on this giveaway or are new to Mum's calling. Try your luck too with Missus Tay on the same giveaway! Her giveaway is for 19 March, 11am show. This giveaway has closed. The winner is Wendelyn T. Congrats! This giveaway ends on 10 Mar 16, 2359 hrs. Date and time of show cannot be changed. Winner will have 24 hours to respond, failing which a new winner will be drawn. Disclaimer: We were kindly given tickets for the purpose of this review. All opinions are solely ours. Photos are with credit to SRT.